It’s pouring down outside. Not a little bit of drizzle, but one of those mornings where a visit to the outside bin seems an adventure too far. So what are your options? Catch up on jobs, join the hoards at your local crowded shopping centre, or settle on the sofa for Saturday morning TV. 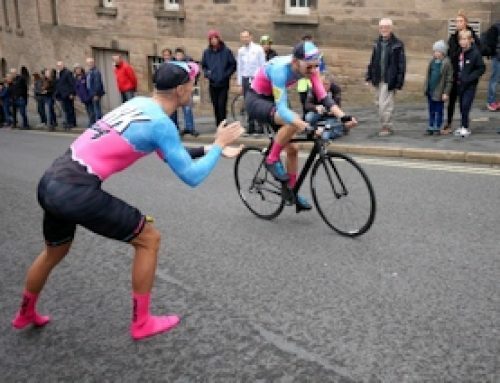 Traditionally, the most dedicated of cyclists would toughen up and face the rain, or alternatively visit a ‘pain cave’ and face the boredom of a turbo trainer or rollers. 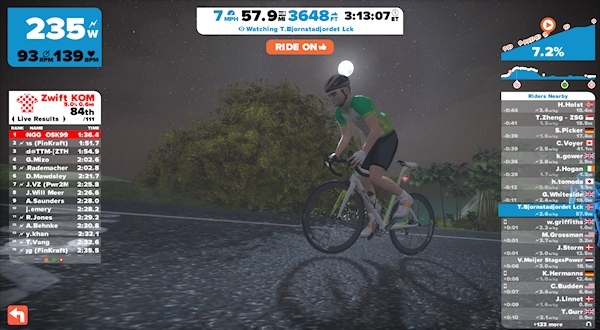 But times have changed, and the combination of the internet, ‘smart’ turbo trainers, and cutting edge gaming technology combine to bring you Zwift – indoor cycling on a new level, minus the boredom. 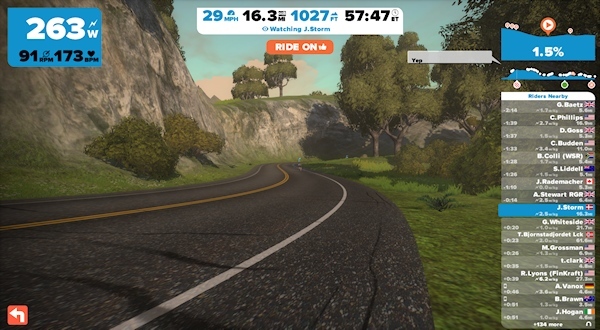 Zwift is still in Beta at the time of writing, with an imminent launch date, when they will start charging a monthly fee for the service. 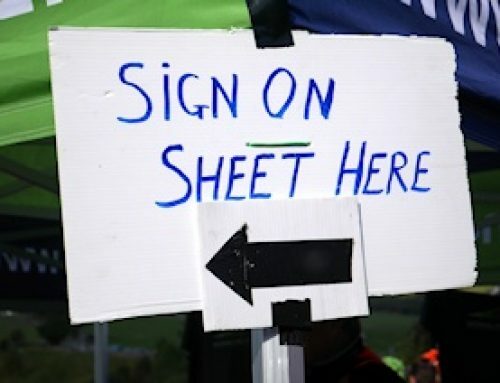 There are currently two locations for you to enjoy: Watopia Island, and the more recent UCI 2015 Road World Championships course in Richmond. 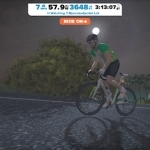 I haven’t got anywhere close to being bored with the courses yet, but Zwift will no doubt face expectations to add more course options as they switch to a paid customer base. 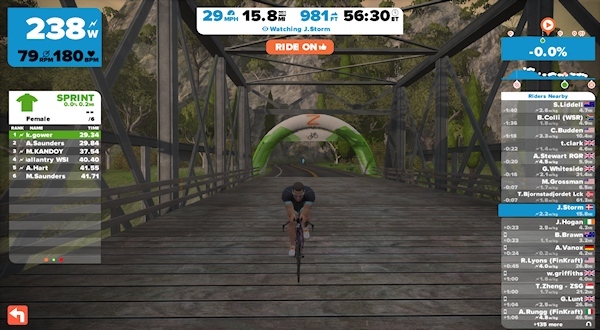 You can use Zwift on a simple classic trainer, but combined with a smart trainer it will control the resistance to reflect the slopes you face on the course, making it a more immersive and realistic experience. 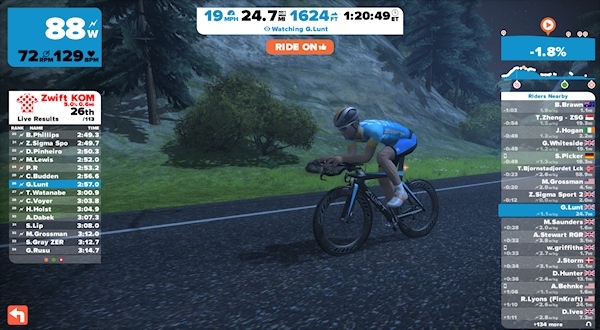 Along with great graphics and a realistic feel, Zwift adds a social aspect to your training sessions as you ride with, or compete against, other riders from across the globe. 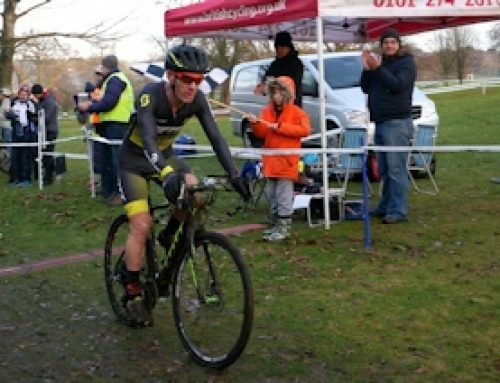 It’s easier to push yourself on your training sessions when you have competition against others, and also against yourself as you tackle your previous times, sprint sections and battle the King of the Mountain segments. 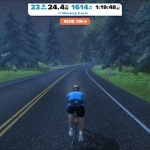 There have been calls for Zwift to add more structured training workouts, and these have been released as of today with the addition of their workout mode based on your FTP (Functional Threshold Power). 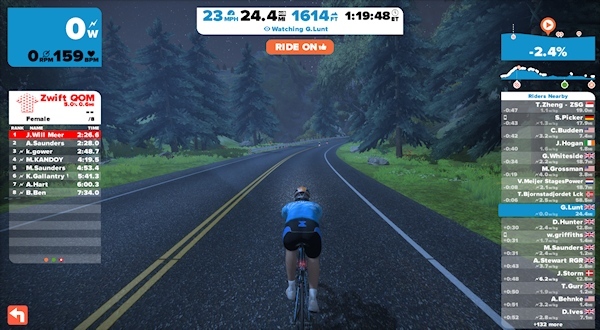 Zwift will currently run on PC or MAC,with hopes for iOS and Android support in Summer 2016. You do need a fairly modern computer setup, it will not for instance work on 32bit computers. 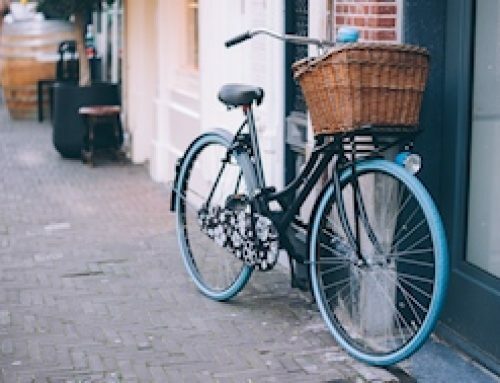 It uses the Ant+ protocol to communicate with your devices, as well as your turbo trainer you can pair it with a heart rate monitor, cadence sensor or power meter. 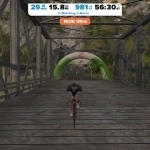 For full details click here to visit the required equipment on the Zwift website. 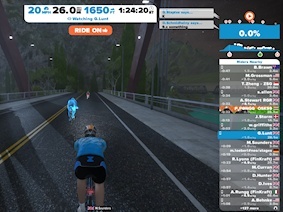 Now at the end of their Beta stage, the Zwift offering seems mature enough to have minimal bugs, and has attracted enough participants to make it an entertaining experience, and a worthwhile workout. The big challenge comes as they try to convert those enjoying the free beta trial to paid up customers, competing against the likes of BKool and Trainer Road with a monthly subscription. 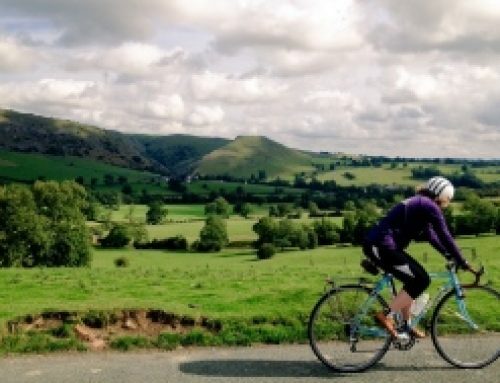 It would be wonderful to see some classic Peak District cycling routes featured in Zwift at some point in the future. Far from taking away from the sights and sounds of actually being in the Peak District, which a computer program could never match, it would surely act as an incentive for tourists to experience the ‘real thing’! 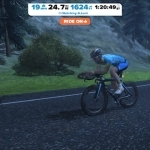 Visit www.zwift.com for further details.